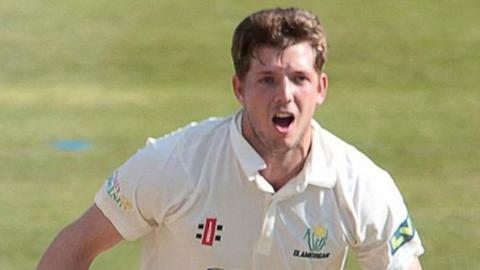 Glamorgan's on-loan all-rounder Craig Meschede is having his "best season yet" after a second four-wicket haul in successive championship matches. Meschede's 4-101 helped limit Lancashire to 462 all out in the second day of the County Championship match at Old Trafford. Glamorgan then reached 48-1 off 16 overs in reply by the close of play. "It's definitely been my best season yet," Meschede said. "That's the reason I came over to Glamorgan to get more first-class experience, to get my bowling up to the tee and I'm very happy with the way the season's gone." Meschede, 23, is on a season-long loan from Somerset, but no announcement has been made as to his future next season. He had featured in every game in all three formats up until the final One-Day Cup match against Lancashire on 18 August, when he was rested. "I can't say anything yet, I've got another year left at Somerset so I have to speak to them and see what they want to do" he told BBC Wales Sport. "I'm pleased to get a four-for, I've had a lot of playing and missing (against my bowling) this year. "It's the most I've ever bowled, this season, but I suppose that's a good thing for me and a good learning curve." Meschede, who was born in South Africa but went to school in Taunton, has scored centuries against Surrey and Northants to top 500 first-class runs for the season. He is also the third leading wicket-taker for the county with 35, after the second-day haul at Old Trafford.